« Louisbourg Fortress—Could This Ancient Bastion in Nova Scotia Be North America’s Most Engaging Living History Program? We Think So! Bert Gildart: Several nights ago while camped along the Cabot Trail the wind came up and began howling through the trees. Before long the wind was generating waves, and from the quiet of our Airstream we could hear them crashing on the shores of nearby Aspy Bay. Though the sight was a delight to watch, particularly there in the moonlight, it wasn’t that way for all people, certainly not for Alex Dunphy, who leads a double life. One life is that of a campground operator, which he and his wife Susan run and where we first met them. The other is the life of a man who can claim (again with his wife, Susan) to be one of the most unique businesses in Nova Scotia. Alex Dunphy is a bonafide oyster farmer in every sense of the word, and for him the night’s winds played havoc with the hundreds of trays floating in Aspy Bay. He works hard to maintain their order, and the work has paid off. 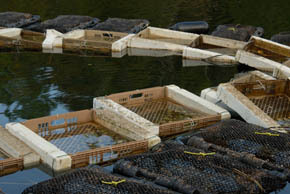 In the past 20 years, Alex has cultivated over a million oysters. But his business requires constant vigilance. As a result, Dunphy’s first order of business for the day was to straighten out the trays, and because the business fascinated us, Alex invited Janie me along for an early morning peek at his business. Cultivating oysters, as we soon discovered, is not easy work. Within minutes of leaving the small harbor on Aspy Bay in Alex’s Johnboat, we arrived at one of the immense lines containing the man’s oyster trays. And what a mess the wind had made of them. Though they weren’t damaged, the winds had certainly rearranged not only the trays, but it had also jumbled the oysters that Dunphy had worked so hard so separate. Rearranging everything took hours, but Dunphy shrugged and said it was all routine. “Just part of the business of growing oysters,” insisted Dunphy. 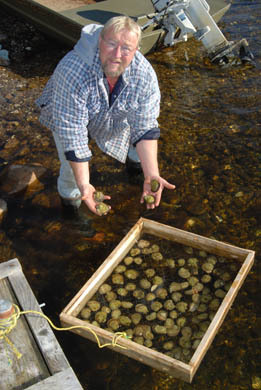 Essentially the seasonal business of growing oysters begins when the ice goes out in spring. At this time, he has to bring up what he put down in the fall. Back then, Dunphy had taken small oysters and placed them into a bag. Then, he’d submerged them to the depth experience had shown would be beyond the depths of the winter ice. Six months later, in spring, he retrieves them using scuba diving equipment. Then he spreads them out, where he then monitors them for growth, which usually occurs at a predictable time of the summer. Alex says that growth begins in June and coincides when temperatures reach 70°F, and it lasts two to three weeks. They then get their reproductive organs going and Alex says he must then be on hand to collect the “spat,” a term used to describe collectively the sperm and the eggs produced by the male and the female. Spat is then placed into “spat collectors,” and that’s what he lowers in the fall and then retrieves again each spring—to then place in the growth trays. And here each group remains until autumn, at which time he lowers them for retrieval again next spring. And so, he says, it goes until an oyster has reached a growth of three inches. Generally, it takes about five years to mature, but of course, we’re not really talking about a single oyster, we’re talking about the 70,000 oysters he produces annually for diverse markets, mostly though in the Cape Breton area. And that, says Alex, is where his wife comes in, something we learned during our four day stay with the Dunphys. 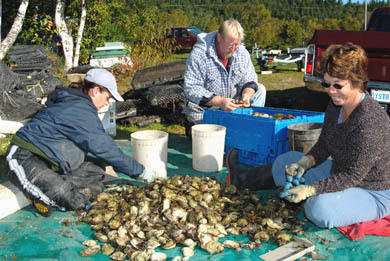 Each morning as we’d leave to further drive the Cabot Trail or kayak its local waters, there would be Susan, sorting oysters. Depending on size, some would be sold to the cocktail market, others for restaurants that purchase them for entrees. But seeing us drive by she takes time for a brief friendly wave. Like her husband, she’s a busy person, and must soon be back at the campground (The Hideaway Campground and Oyster Market) desk to greet new campers—or repeat campers who might want to purchase oysters for an evening meal. This entry was posted on Tuesday, October 3rd, 2006 at 5:44 am and is filed under RV Travel, Travel. You can follow any responses to this entry through the RSS 2.0 feed. You can leave a response, or trackback from your own site. I live in south western Nova Scotia and am considering buying an acre of land that is right on the river which directly connects to the ocean. It has a building on it that was previously used as a boat builder shop; therefore you can sail right out to the ocean from there. I am seriously considering buying the property and starting an oyster business but I am very ignorant at this point. I got the idea from a friend of mine who runs a successful fresh water oyster farm from her home not too far from where I plan to start mine — except mine would be salt water. Can you give me any pointers or guide me in the right direction? Are there any grants offered for this sort of thing?